For the open Hardware Rallylog device I’ve been working on, I’d based my design around fitting into the handy Sparkfun Project Case and since most of my projects never get to the “enclosure” stage, they are either used bare PCB or thrown into anything that may provide some protection against the elements, such as the widget sensor housing. This project was different for me since I’m required to build 10 of them for the local motorbike club, something a bit more “finished” than your standard geek project. 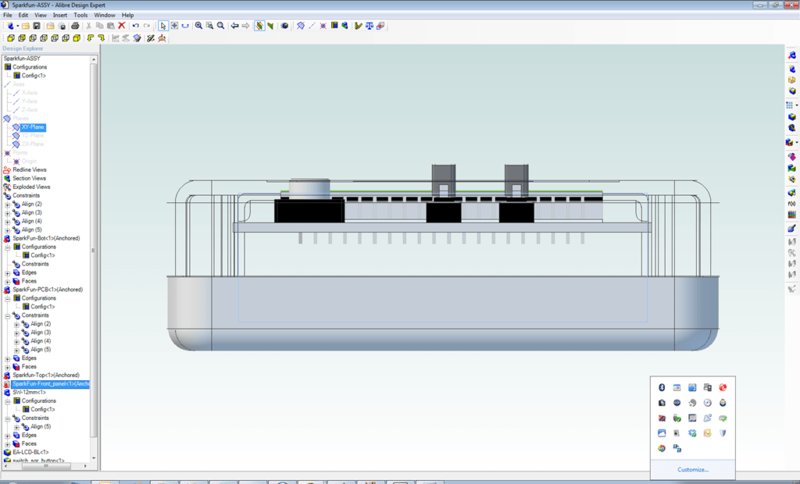 Throughout this project I’ve learnt how to use 3D modelling to check mechanical layout and tolerances, also to use mechanical data supplied in technical data sheets in selecting my components. This along with taking into account PCB heights, button heights. Overcoming challenges like how do I get my LEDs to the outside without using panel mount LEDS, or how do I protect or mount my LCD display again with out using a panel mount. I then used all this to make things easier for me when it came to production to produce CNC tool path G-Code to cut my enclosures. 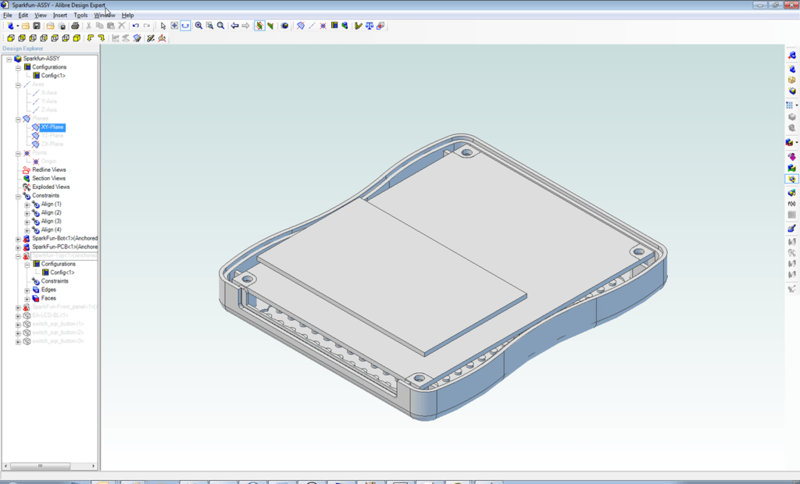 I thought I’d document the process that I’ve gone through to get my Rallylog nice and snug in the Sparkfun Project Case. BTW this may not be the right way, but it’s the journey I took, I would love to hear from people who do this professionally for a living to get a feel of the full product design process. Right from the outset of the project I wanted this to be easy to assemble. Seeing I have to make 10 of them (to start with) I wanted everything to be mounted on the PCB so all I have to do is get my enclosure and put in the finished PCB, screw it all up and its working, i.e. I didn’t want to have a panel mounted LCD or LEDS that I had 1) manually fix to the Enclosure, and then 2) “wire” back to the PCB. I wanted something that I can reproduce easily and with the least amount of human work, I love my projects, but quickly hate having to manually do a lot of repetitive work like solder up individual LEDS etc. (I guess I ‘m lazy). I also have a small CNC machine at home, A Zenbot Mini that I purchased off eBay some time ago, so I wanted to automate the panel cut outs as much as possible. I wanted this to be repeatable, using a handheld Dremal is not my idea of fun, especially if I have 10 to do now I will quickly loose interest after the first one, and it’s definitely not repeatable. Also if I get an order for another 1, 10, 100 down the track I definitely don’t want to do it manually, and I don’t want to think too hard about getting things set up. I could have also gone with an Arduino board and made up a custom shield or use the RFID shield, again it would have meant more painful hand assembly, so I decided to stick with a custom board fitted into a readymade enclosure. Will it be easy to assemble? 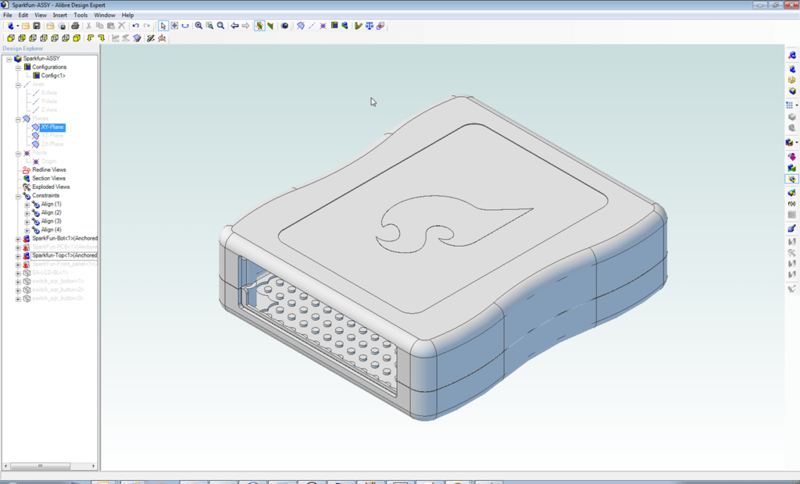 When you stop and think about it, it makes sense to start with the user interface and how this will fit into an enclosure, then move onto the physical PCB layout and component selections, else my PCB might not fit into the case, it may be too big, too small, same goes for components selected. The user interface may not be functional and then we’d have to start again. My initial schematics included a Nokia LCD display and a joystick for user input. Also a couple of LEDS for visual feedback. When I asked myself the three questions above I quickly went back to the drawing board, as the Nokia display failed Question 3), same went for the Joystick, also I felt that it was would have been a bit too had for the target audience to use, so it failed Question 2) as well. 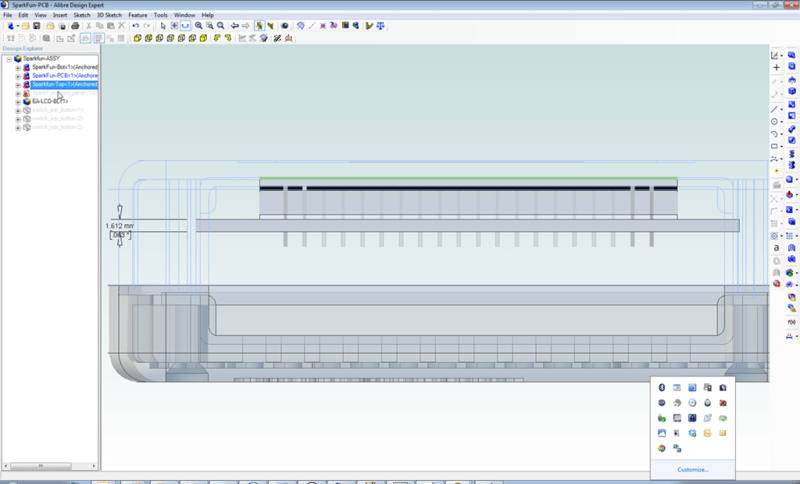 In the end I decided to go back to a tried and proven UI design that consisted of a simple and easy to read backlight 2×16 LCD character display with three push buttons for user input and two LED indicators, something a bit easier for the end user to use. As yet I had not selected the parts i.e. the LCD or switches, I just had the layout in my mind (or on paper) the UI layout that was a three button input under a standard 2×16 backlit character LCD, and x2 LEDS to the left of the LCD display, these LEDS would be Red and Green, which could be used to indicate different statuses easily, really simple! 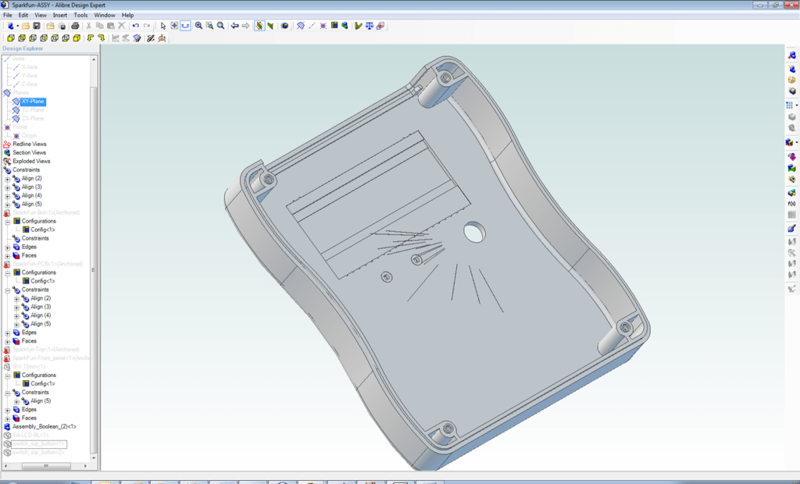 Once I had the basis of the interface this is where the engineering juggling started, I had to find an enclosure that would meet my requirement, and find components at the right price that would work with the selected enclosure in the way I wanted. I had a look around on a number of sites and found there is a wide variety of enclosures out there, however without physically having one, its a bit hard to start working out measurements and getting a general feel for it in your hand. As luck would have it I already had a couple of Sparkfun Project cases at home that I had purchased for a “future” project, well this was that “future” project, I used this initially as my enclosure of choice, it seemed to fit well in the hand and be spacious enough to seemingly fit everything in, i did this initial check by putting in the ID-20 RFID reader module and a 9V battery to see how things would fit. At this point I still did not have an LCD or buttons selected. 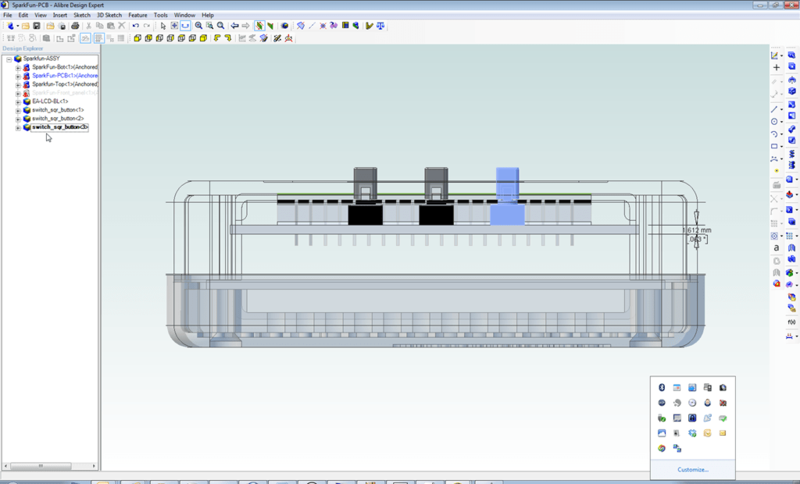 Once I had my enclosure selected it is now a matter of finding the right size components to fit, as mentioned above I wanted everything mounted on my PCB, and now I had the dimensions of the enclosure I could start my PCB design and component selection, this process I found to be the most time consuming. 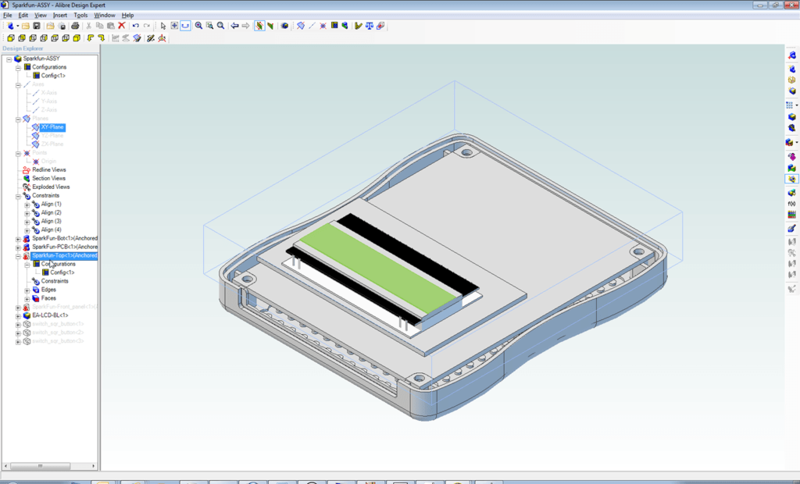 However I initially needed to start working out my clearances with my PCB in the enclosure, I’m also a visual person, I need to see things to make it easier for me to understand, so I decided it would be much easier to utilise 3D modelling and model the enclosure and mock up my UI, I’ve used Alibre in the past and this is what I modelled the Rallylog enclosure in. Not wanting to re-invent the wheel I contacted Sparkfun customer support with a request for a 3D model of the Project enclosure and received an email from Casey Haskill, the designer of the enclosure, he was more than accommodating (Many Thanks Casey!!!) and sent me the files in IGES format, one that Alibre supported……supposedly. The great things with standards is that everyone has their own take on them, obviously Alibre was no exception, the problem was that each time I went to import it failed, after a bit of research I found a small utility program that I used in a two step process that allowed me to clean up the IGES and export it as an STP file, one that worked with Alibre. 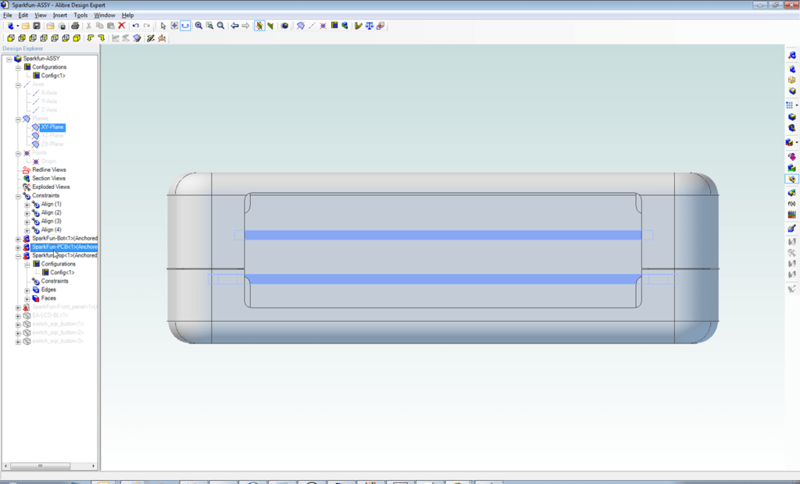 Once imported I can now can get accurate measurements and start modelling individual components. My modelling is very simple, make a basic 3D model using the supplied mechanical data, no fancy surface or trying to emulate the real thing. One of the immediate things I could see is that either I had to use a panel mounted PCB or I needed a two tiered PCB design as the headroom above the PCB was quite large. The panel mounted LCD was ruled out due to easy of assembly rule, so I knew that I would be dealing with a two layered PCB design. 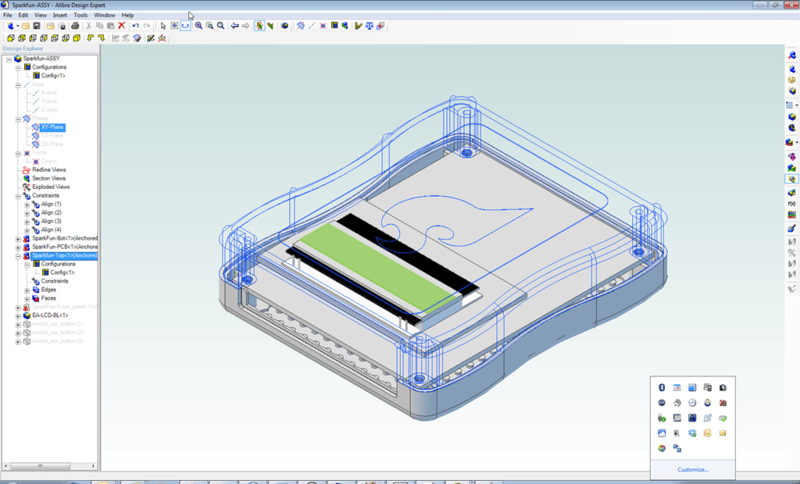 Alibre is great for quickly creating 3D objects and by changing dimensions it regenerates the 3Dmodel, so I quickly created a two tiered mock up of a PCB with the correct thicknesses of the PCB substrate being used, this was added to the enclosure assemble so I could visualise the internal dimensions. 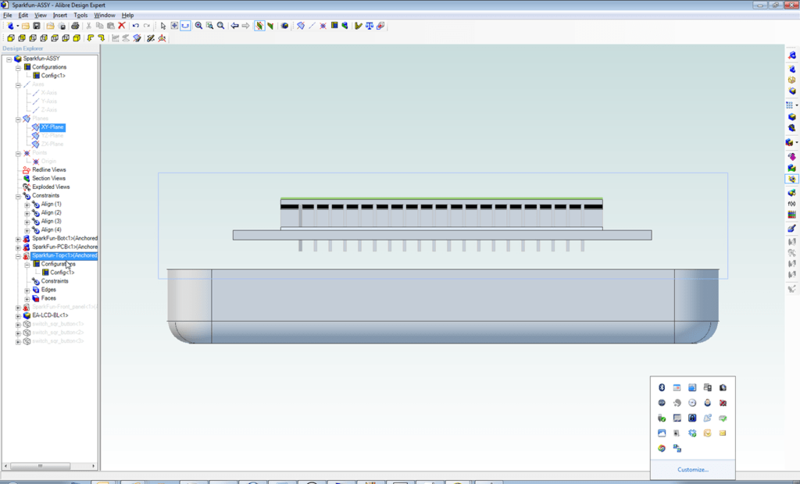 The two PCB layers are separated by the dimensions of a standard 0.100 header and socket of 8.5mm. From this I now had the dimensions required from the top of my PCB to the inside and outside of my case. Now I needed to know what LCDs, buttons and LEDs out there that when mounted on the PCB how they would interact mechanically as far as clearances with the enclosure, however I had to work into the constrains of my circuit design and of course price. Due to I/O restraints I couldn’t use the standard character LCD in 8 bit or even 4 bit mode, so that ruled out most of the cheapest LCD displays around. So it had to be I2C, SPI or Serial, my initial design was done with the Nokia LCD in mind and so used SPI, as I wanted it to mount onto my PCB, almost all LCD I’ve found have their own PCB with a connector that either plugs into a cable or you plug it into a socket onto the PCB, so another layer on top of the existing PCB was not feasible. I located the I2C range of New Haven Displays and found one that would fit given the dimensions, however I couldn’t get them locally and ordering in from New Haven was approx. $USD50 per display, not economical! Unfortunately there were not many alternatives. From this I could see that the LCD would fit if PCB mounted, but had an interference with the top of the Sparkfun case, this was acceptable as I would need to machine the cut-outs at some point. I then did the same for switches and their buttons, I wanted the button to just clear the case and not be too pronounced or the reverse I didn’t want it to be recessed. In the example below using 6mm Omron switches and their associated square buttons. I found they were too pronounced out of the case. I ended up finding the 12mm Sparkfun Push Button which met the right criteria and the button just cleared the case, after modelling it looked perfect, however the switch body itself has some interference with the top of the case, this meant that if I wanted to have a switch with the right height I would have to machine out the inside of the case. Engineering decision time….After weighing up the aesthetics and the work involved in machining out the case I decided to stick with machining out the inside as I would already have the top case mounted for cut outs, what if I just flip it around and machine from the inside, that way I could kill two birds with one stone. I could pocket out around the switches ( and the LCD if required) and then perform the panel cut out. I didn’t know how I was going to perform this but seemed doable. Just to make sure where my interferences I used a great feature of Alibre called “Assembly Boolean” where I can select the top of the project box as my blank, and then select all the buttons and the LCD as my tools, the Result is the top of the Project box with all interferences subtracted so I can I know where to machine. What about The next thing I needed to worry about was what to do with the LEDS. Where possible I now use SMD components rather that PTH, but using the PTH over SMD was going to be my only choice, however they would be standing quite tall off the board, and as the end user would have to remove the back of the case to eventually change batteries, I didn’t want them to be able to damage the LEDs if incorrectly re-assembled for any reason. 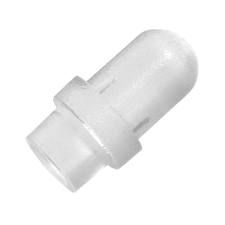 I started looking around for solutions, not being in the industry I wondered how they did it, looking at every day consumer electronics I saw that pretty well every LED indicator is displayed through a plastic window, that’s what I needed, but what are they, after much Googling I found the correct term of “Light Pipe”, this made things easy. I could stick with my 0603 SMD LEDS and have a standard 3mm vertical light pipe (they come in many different flavours) bought directly to the top of the SMD LED. Happy with the components selected I then proceeded to finished my PCB design, again to make things easy to assemble I designed the two layers as a single board separated by tabbed routes and tooling strips so the individual boards can be separated after assembly. I also moved my LEDS over to the right hand side to accommodate for the PCB connectors finished result. I’ve made a similar handheld enclosure design for a specialised light meter (essentially a nano amp meter), although I didn’t end up modelling it all in 3D. I just printed out the PCB layout on paper, stuck that to cardboard, and drilled the holes. I then mounted the large components, and verified clearances. In my case I mounted a standard 16x LCD on top of the PCB, and made extenders on the lathe for the 3 SMD push buttons. I used the clear sparkfun case so I didn’t need a cutout for the LCD, although I’ve cutout front panels on my CNC in a very similar fashion to that in your next post – cutting out the template holder, then milling from the back.